You’ve surely heard of the Wizard of Oz? Many people know it as the FAMOUS OLD MOVIE starring Judy Garland as Dorothy and a dog called Toto. It was of course originally a book that took the world by storm in 1900 when it was published and it grew into a publishing empire for author Frank L Baum. For a book to become a smash hit in 1900 and the years later, it must have been a pretty magical tale. It was 39 odd years later when the Hollywood movie was released. It was a popular movie at the time but it came into its own as the years went by due to repeated showings on American TV and it became a cultural touch stone where even 60 years later, the movie was remade by Tim Burton and Wicked is a hugely popular broad way musical. And even George Lucas managed to get caught up in the magic of the movie. "Star Wars" is a fairy tale, a fantasy, a legend, finding its roots in some of our most popular fictions. 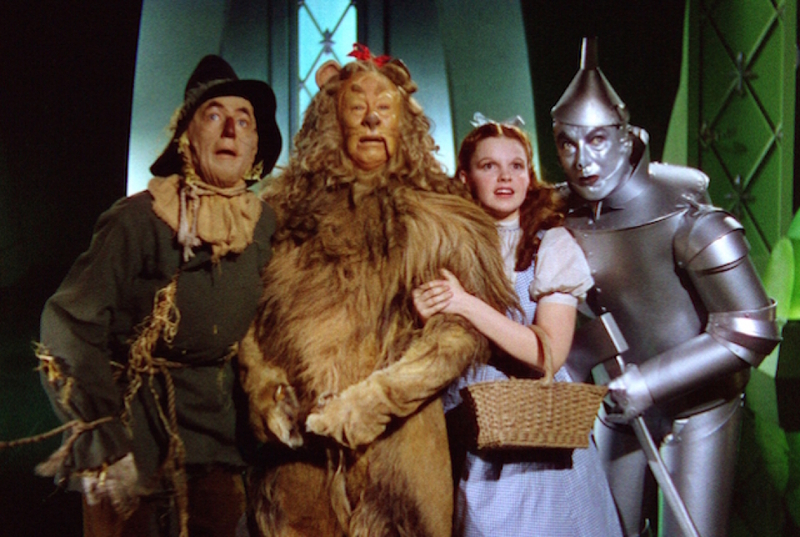 The golden robot, lion-faced space pilot, and insecure little computer on wheels must have been suggested by the Tin Man, the Cowardly Lion, and the Scarecrow in "The Wizard of Oz." Egbert's same review noted many other influences on the film. Let's begin with Luke Skywalker. If we posit the equation that 'Luke = Dorothy', we can begin to unlock some of the parallels between the two characters. They both are looking for something more. Luke wants to go to the Academy to fly things and likes to stare into the Binary Sunset and ponder such things. Dorothy states her deal when she sings Somewhere over the rainbow. They each have complementary farm hands. Hunk, Zeke, and Hickory for Oz and C–3PO and R2-D2 respectively. Each has their world turn upside down. Dorothy's is literally thrown around by a tornardo, and Luke's by the Vader's stormtroopers murdering his family (which was actually a call out to John Wayne's The Searchers). The two characters also become surrounded by familiar companions. R2-D2 steps in for Toto. Both don't speak English and one could argue that R-TWO D TWO is a play on TO TO. It is very important to bear in mind that the duo of R2 and C3PO were directly inspired by characters from The Hidden Fortress, so don't think Lucas is wholly copying from Oz. George Lucas has previously said that he took facets of Luke’s personality and made them into characters, and that that’s how he came up with Luke’s friends and companions. And that's pretty much what happen in Oz. An amusing parallel is that when Darth Vader kills Obi-Wan Kenobi, only Kenobi's robes remain as his body has disappeared into the Force. When Dorothy accidentally kills the Wicked Which of the West, only her robes too remain after the water is thrown on her. In each case, both scenes have become very famous film moments. At the end of the day Luke and Dorothy have both had a life changing adventure. the difference being that Luke's family is still dead and while Dorothy bested the Witch and outed the Wizard, the Empire lives on. I should be at pains to point out that Lucas has not taken point from point from the Wizard of Oz to write his script. He actually took hundreds of elements from books and film and real world issues and turned them into his own unique fairy tale, and arguably gone that had an even bigger impact on film than Baum's first book did on literature. So let's give him a fair due on that point. Can you pick what this is going to be? 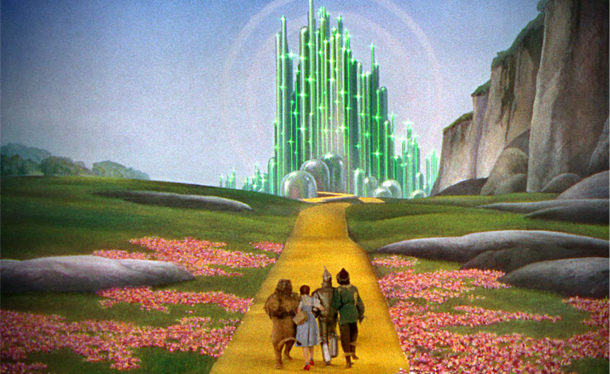 Like Dorothy and her new friends went off to the Wizard's Emerald City, C3PO and his little buddy R2 headed off to Jabba's Palace, each party not really knowing what their fates would be. There's an amusing story relating to production era of The Force Awakens. We suspect this might have been a cheeky tale from Fisher because Reynolds apparently sold the shoes in 2011 well before TFA script was written!